As an adult, it’s hard to imagine settling down for a good night’s sleep without a pillow. While the youngest of children don’t need (and shouldn’t have) a pillow, the support of a good pillow is certainly crucial for comfort as kids get older. The best pillows for kids offer the support a growing neck and head needs, the durability to last even in the face of the kind of messes only children can make, high-quality hypoallergenic materials, a reasonable cost and easy availability. When choosing a pillow for your kids, you might look for different qualities than you would want for your own pillow. A regular adult-sized pillow would be huge in a crib or toddler bed. Make sure you get a pillow that’s the right size – little – for your little one. For small children, a pillow with dimensions around half the size of an adult’s pillow – think 12” by 16”, or the size of an airline pillow – is ideal. For the best support without danger of suffocation, choose a firm, relatively thin pillow, not a lavishly thick and fluffy one. Look for memory foam pillows or traditional filled pillows made from a safe and hypoallergenic or organic filling like natural fiber or polyester. Fillings like feathers and goose down can trigger allergies and be too soft to provide enough support, while pellet fillings such as buckwheat could pose a choking hazard or be ingested if the material were to rip and the pellets spilled. Every entry on our top 10 best pillows for kids list is an excellent choice to give your child a safe, comfortable sleeping environment. What better choice for your own little sleepyhead than this completely hypoallergenic pillow with thousands of positive reviews, two sizes for kids of different ages and two filling options? Little Sleepy Head’s original toddler pillow, measuring at 13 by 18 inches, costs $18.95, which is actually a pretty middle-of-the-road price for a pillow made with quality, child-safe materials. For big kids, the company makes a16 by 22-inch youth pillow – the perfect size for those too big for a toddler pillow but not quite big enough to need a standard pillow – at the $21.95 price point. Little Sleepy Head also offers less-filled versions of both sizes if you buy directly from the company’s website, as well as an organic version of the toddler pillow. The premium polyester cluster fiber filling beneath a soft cotton cover conforms to let your child get cozy. Parents love that the whole pillow is machine-washable – after all, anyone who is around kids a lot knows that messes happen, even in the middle of the night – and the Love the Fluff guarantee that promises to replace an unsatisfactory pillow with a custom-filled one if needed. Even better, a portion of every sale supports a worthy charitable cause. Entire pillow is 100 percent hypoallergenic. A soft, 200-thread count cotton cover. Like memory foam, the premium polyester cluster fiber filling will conform to your child’s body for more comfort and a better night’s sleep. Founded by a California mom who was desperate to get her two sons to finally get a good night’s sleep, Little Sleepy Head is a small, family-operated business, and most of its products are proudly made in America. 90-day no-questions-asked guarantee allows your kids to try the pillow for months before deciding to keep or return it. With the Love the Fluff guarantee, you can feel confident that if the original pillow you receive proves to be too thick or fluffy for your child’s preference, the manufacturer will create a custom-filled one perfect for your kid. A percentage of each pillow sale benefits The Michael Hoefflin Foundation for Children’s Cancer, to which Little Sleepy Head also donates pillows for sick children. Customers have written more than 5,400 positive reviews of this wildly popular children’s pillow. Not organic, unless you pay more for the organic version available on the manufacturer’s website. Unlike other kids’ pillows that come in fun designs and colors, Little Sleepy Head’s toddler and youth pillows come in plain white only. The company makes fun printed pillowcases, but they aren’t included with the pillow and retail for an additional $16.95 each (and you know you’ll need more than one for those middle-of-the-night messes). Some purchases reported that their pillows grew lumpy with use. Less-filled and organic versions aren’t widely available on major retail sites like Amazon. If you’re hesitant to commit to a pillow for your child, the KeaBabies Hypoallergenic Pillow could be the perfect place to start. The 365-day manufacturer’s money back guarantee gives you an entire year to see how your child likes the pillow and how resilient it is. At a middle-of-the-road price point of $17.96 for the plain white version or $18.96 for the adorable safari print, it’s good value for parents who prize durability. The whole pillow was ergonomically designed in consultation with a children’s chiropractor to provide ideal spinal support and comfort for little ones. The filling consists of polyester fiber balls designed with withstand repeated washes without becoming lumpy, covered with a fully hypoallergenic certified organic cotton shell. One plain or safari print organic cotton pillowcase is included. A chiropractor specializing in children’s chiropractic care helped design this ergonomic pillow for superior spinal support for children ages two to five. High-quality polyester fiber balls make for a more resilient filling that resists the lumpiness and flattening that often occurs when you wash traditional cotton pillows. The pillow cover is made of 100 percent hypoallergenic certified organic cotton. One pillowcase included, either plain or safari print option available. Machine wash and dry the pillowcase and the pillow itself. Free of harsh flame-retardant chemicals. 365-day sleep trial period with manufacturer’s money-back guarantee. Customers have written 185 positive reviews of this pillow. Only one size, 13 by 18 inches, available, so this pillow is only suitable for toddlers ages two to five. Some buyers reported that lumpiness developed in spite of the ball fiber filling design when the pillow was washed and dried. The company suggested air drying as the remedy, even though washing instructions specify machine wash and dry. Some purchasers, especially those who mistakenly believed the entire pillow was cotton and not just the cover, weren’t sure that the quality matched the price. If organic is at the top of your list of must-have’s for your child’s first pillow, turn your attention to the organic toddler pillow by My Little North Star. The hypoallergenic poly cluster fiber filling has a shell of soft certified organic cotton. A chiropractor had a hand in developing this 13 by 18-inch pillow, so it’s no wonder that chiropractors recommend My Little North Star’s exceptional head and neck support for children two to five years old. With no pesticides, flame retardants or other harsh chemicals, you never have to worry about the pillow bringing harm to your child. There’s no need for a pillowcase, and when it gets dirty, just toss the whole pillow in the washing machine and then the dryer. Like Little Sleepy Head, My Little North Star will replace pillows that are too fluffy or too flat with custom-filled ones, so parents have nothing to lose. Pillow cover is 100 percent certified organic cotton made from sustainable sources, which makes it better for your baby and for the environment. The special poly cluster fiber filling is both soft and hypoallergenic for ultimate comfort and cleanliness and is designed to avoid becoming lumpy with use and repeated washes over time. Chemical-free materials, containing no pesticides, herbicides, fungicides, flame retardants, dust mite repellants, formaldehyde, latex, lead, BPA, phthalate or toxic materials. Chiropractor designed and recommended for better sleeping posture that supports the neck and head, allowing for a deeper and more restful sleep. The $19.95 price is reasonably affordable, especially for organic materials, which often cost much more than conventional materials. My Little North Star is a family-owned small business based in the U.S., with its products proudly made in America from sustainable organic materials. The company promises complete customer satisfaction and, if you aren’t happy with your purchase, will return your child’s pillow or replace it with a custom filled pillow that suits your child’s liking, no questions asked. Satisfied customers have left nearly 550 positive reviews for this product. No one pillow is perfect for every individual. Some buyers felt that this pillow was too flat or didn’t offer enough support. Pillowcase not included. My Little North Star makes organic pillowcases in only one print, with a $17.99 price tag. Real memory foam for your little one? Treat your sweet son or daughter to real luxury with the Relax Right Toddler Memory Foam Pillow, selling for $18.99 on Amazon, or the Relax Right Big Kid Memory Foam Pillow, for $39.99. Just like memory foam pillows for grownups, this kid-sized pillow – 15 by 9 ¾ by 3 inches for the toddler size and 19 by 12 by 3 ¼ inches for the big kid size – conforms to the user’s body for a perfect fit. The sides of the hypoallergenic pillow have varying degrees of thickness and firmness, making it multi-positional, so your kid can customize the pillow to his or her preferred sleeping position. Doctor-designed for healthy sleeping posture, the patented hollow core inner design combined with the conventional cervical pillow outer design offers better support for the neck and a soft, “hammock effect” feel for your head. Get comfy and fend off illnesses with the washable, antimicrobial soft velour cover made of an 80 percent/20 percent cotton blend. Two size options make this pillow perfect for kids of all ages. The toddler size is for children between two and five years old, and the big kid size is intended for children five and up. Real memory foam designed to mold to the perfect shape for your child and keep that shape over time. Hypoallergenic with a microbial cover to keep your child healthy. Multi-positional design allows users to further customize the pillow for ideal comfort. Doctor designed for safe sleeping posture. The standard cervical pillow design supports small necks and spinal alignment. A patented hollow core is softer under your little one’s head and topped with a plush 80 percent/20 percent cotton blend velour cover. Moderate price point for toddler size. Pillow itself is spot-clean only, and while the cover is machine washable, air drying is recommended. Some purchases found the pillow too hard to be comfortable, even with the hollow core design. The pillow cover has a zipper, which parents often worry could post a choking hazard. The toddler size is extra small, even compared to other toddler pillows. The $34.99 price tag for the big kids’ size is on the higher end. Some buyers complained about an initial smell. Only a couple dozen positive customer reviews on Amazon. If you’re comfortable with a higher price point, this cool-sleeping shredded memory foam-filled pillow is perfect for your snuggly little guy or girl! At a cost of $29.99 for the 13 by 18-inch version, the Snuggle-Pedic pillow offers the same grownup comforts you enjoy for kids as young as toddlers. Inside this soft and resilient pillow is a proprietary combination of shredded high-end hypoallergenic memory foams intended to support young sleepers no matter how they prefer to sleep. A polyester, bamboo and Lycra blend makes the Kool-Flow® Micro-Vented Cover more breathable than competitors, allowing your child to sleep cool even on the warmest nights. While the kid’s pillow is a traditional toddler size, the manufacturer boasts that it adjusts to offer enough support for children of every age to sleep comfortably. The company stands behind this pillow with a 20-year warranty, and if you aren’t happy with your pillow purchase, Snuggle-Pedic offers free personal customization so that your child can sleep soundly on his or her perfectly filled pillow. The proprietary mix of shredded memory foam filling makes the pillow uniquely resilient and supportive enough to support back, side and stomach sleepers. The vented Kool-Flow® cover is extra breathable to help your kid sleep cool all night long. The pillow is adjustable and supportive enough for kids of all ages, not just toddlers. Pillow is made of quality “green” ingredients without the dangerous chemicals, including heavy metals and formaldehyde. Shredded memory foam blend is low-emissions and includes Biogreen memory foam and CertiPur-U.S. certified foam. Proudly made in the United States in the company’s own factory in Westlake Village, CA. See how the pillow holds up over months of use with the 120-night sleep trial. If you aren’t happy with your purchase, you can have the amount of filling adjusted for free or get your money back with the 90-day no-hassle refund guarantee. The manufacturer is so confident that the pillow will last that it offers a 20-year warranty. Amazon customers have written 180 positive reviews of the pillow. The $29.99 price is a bit steep for the small 13 by 18-inch size, especially since it is not made of fully certified organic materials. Though supportive enough to be used beyond toddlerhood, the pillow might be too small for older kids. The pillow is compressed for shipping and is supposed to re-inflate once out of the box. However, some purchasers reported that their pillows failed to re-inflate and instead remained hard or lumpy. This may require extra steps to fluff the pilling in the dryer or, if that fails, a replacement. Some users thought the pillow was too thick or fluffy for a child to sleep comfortably. Shredded memory foam has a different feel than solid memory foam, so know what kind of pillow you are getting for your purchase. The cutest kid’s pillow to make our top 10 ranking list is this Hypoallergenic Toddler Pillow made by A Little Pillow. Made to be used without a pillowcase, this adorable pillow comes in nine color options that are sure to please your little one, with prints ranging from the subtle to the wild. Its 13 by 18-inch dimensions make it the perfect pediatrician-recommended size for children ages two to four years old. The 100 percent cotton shell holds the ideal amount of deluxe cluster fiber filling to support little necks and shoulders without being too thick for comfort. Because these cluster fibers have what the company calls a “lock-in” ability, there’s some room for customizing the thickness and fluffiness of the pillow on your own through easy manual flattening. For older kids, A Little Pillow Company makes a $25.95 Customizable Youth Pillow that grows with your child, intentionally overstuffed and made with a hidden zipper so parents can remove excess fluff now and increase the fluffiness as their child grows. Deluxe cluster filling is made of the highest-grade poly fiber available and has a special “lock-in” quality that allows you to adjust the height and fluffiness of the pillow through manual flattening. The 200-thread count 100 percent cotton cover is double stitched for added durability. The pillow is hypoallergenic and free of antimicrobials, flame-retardants and other harsh chemicals. The toddler pillow comes in nine colors and prints to choose from, so you can be sure your little one will love the look of his or her new pillow. Moderate $18.95 price point for toddler pillow and $25.95 price for youth pillow. The A Little Pillow Company is the longest-established specialty toddler pillow company, having been founded in 2007. The small family-owned company is based in Virginia, and all of its pillows and pillowcases are American-made. Customers have written 1,860 positive reviews of the toddler pillow, plus more than 50 positive reviews of the youth pillow. The pillow tends to fluff up with machine washing and drying, but it can be manually flattened. Some buyers felt that the cotton shell was too rough to be used without a pillowcase as advertised, and no pillowcase is included. Some purchasers felt that the toddler pillow was too fluffy and thick for the youngest children. Since 1958, the family-founded, -owned and -operated company behind Little One’s Pillow had manufactured pillows of varying sizes with 100 percent American-made materials. Little One’s Pillow is the company’s organic toddler-sized sleep solution, measuring at 13 by 18 inches and retailing for $22.95. This high-quality pillow has a soft shell of 270-thread count certified organic cotton sourced from American farms and the company’s own proprietary poly cluster fiber filling that won’t get lumpy even with repeated washes. Parents feel good about the hypoallergenic, chemical-free materials and can rest easy that each pillow is individually inspected for quality. Designed in consultation with chiropractors and pediatricians to achieve the perfect amount of fluff for healthy sleeping posture, the pillow shouldn’t strain your child’s neck or be too flat for comfort. However, if your kid isn’t happy with the amount of fluff included, the company will customize the level of filling at your request. Unique poly cluster fiber filling is hypoallergenic to protect your little one and specially designed not to get lumpy, no matter how many times you wash it. The 270-thread count,100 percent certified organic cotton cover is dust might resistant and soft enough that no pillowcase is needed. Chiropractors and pediatricians consulted on the design to determine just the right amount of filling needed for ideal comfort and support for little heads, necks and shoulders. Organic cotton and premium polyester fiber filling are 100 percent sourced from American farms. Every pillow is individually inspected for quality and comes with a one-year guarantee. If your child isn’t comfortable with the amount of filling that comes in the pillow, simply contact the company, and they will create a new custom-filled pillow that’s perfect for your child. The pillow is chemical-free, containing no harsh flame-retardants, pesticides, fungicides, herbicides or GMOs. The manufacturer is a family business with more than 60 years of experience making high-quality pillows. Amazon customers have left more than 2,680 positive reviews for this pillow. Pillowcase not included, though the pillow can be used without one. Some buyers found the pillows too flat, though the seller is willing to replace unsatisfactory pillows with custom-filled ones at no charge. The pillow is only big enough for toddlers up to age four or five, with no option for big kids. A great option for families on a budget, the Celeep Baby Pillow is just $19.97 for a two-pack but offers features found in pillows twice as pricey. Each 13 by 18-inch toddler pillow is fully hypoallergenic and ergonomic, with the chiropractor recommended amount of 7D hollow siliconized microfiber filling to support little heads and necks. If a mess occurs, throw the whole pillow right in the washing machine and dryer (and you have a backup for your child to sleep on in the meantime). Designed not to get lumpy and to resist mold, mildew and dust mites, you can count on this affordable pillow to be a safe and comfortable choice for your precious toddler. The pillow comes with a 30-day 100 percent satisfaction guarantee and has garnered hundreds of positive customer reviews. The $19.97 cost for two toddler pillows is a great value, especially with most of the best pillows for kids costing that much just for a single pillow. The 100 percent ergonomic design follows chiropractor recommendations for the ideal filling amount for children two to four years old. The 7D hollow siliconized microfiber filling is designed not to become lumpy, even with repeated washes, and covered with a soft shell made of 100 percent cotton. The pillow is 100 percent hypoallergenic and resists mold, mildew and dust mites to protect your child. The pillow has more than 360 positive customer reviews. Some buyers reported poor-quality sewing, with seams that ripped. Seller does not disclose thread count on online listings or product packaging or promote it as a selling point, and customers have reported that the fabric is not what they would consider high-quality. Some purchasers found the pillow too thick of fluffy for the recommended age group, especially after washing it. The 30-day money-back guarantee is a considerably shorter warranty than a lot of the best kids’ pillows offer. Dreamtown Kids has an option for every budget. The regular toddler pillow, 14 by 19 inches, is $14.99, while the organic version, slightly smaller at 13 by 19 inches, is $21.96. The organic pillow is also available in a larger size – 16 by 22 inches, between a traditional toddler pillow and a standard twin pillow – for big kids at a price point of $34.99. Each option is designed in consultation with a chiropractor and made in the USA by a family-owned and -operated business. A dense polyester fiber filling provides the support your toddler or big kid needs for a comfortable night’s sleep and healthy posture. The standard toddler pillow has a soft, 200-thread count polyester/cotton blend cover, while the shell for both organic options is handmade from 100 percent certified organic cotton. All of the Dreamtown Kids pillows are fully hypoallergenic and mold and mildew resistant to and have undergone testing for heavy metals and microbials. Thousands of customers have praised the quality of Dreamtown Kids pillows. Pillows are designed in consultation with a chiropractor who specializes in upper cervical chiropractic care to provide the perfect amount of filling to support growing spines without being too bulky for comfort. Two sizes available to accommodate both toddlers and big kids. Soft yet supportable dense polyester fiber filling is designed to resist flattening and hold its shape, even after repeated washes. Both regular and organic options available, with a 200-thread count polyester/cotton blend cover for the original pillow and a 200-thread count handmade certified organic cotton shell for the organic pillow. Hypoallergenic, mold-resistant and mildew-resistant, yet free of harsh chemicals to protect your child. Dreamtown Kids pillows are tested for mold, microbials and heavy metals in a CPSC-approved lab to attain a Child Product Certificate demonstrating compliance with safety regulations. The modest price points for the original pillow and even the slightly costlier organic toddler version are in the mid-range of affordability. The six-month 100 percent satisfaction guarantee gives customers one of the longest periods of time to return the pillow for a replacement or refund out of all children’s pillow companies. The family-owned and -operated small business that manufactures Dreamtown Kids pillows in the U.S. has been recognized for its excellent customer service. The original toddler pillow has been wildly popular, garnering 3,600 positive reviews, and the organic version has acquired more than 280 glowing customer reviews. Some buyers complained that Dreamtown Kids pillows are too thick and fluffy to be comfortable at first, especially for young children. Purchasers have occasionally reported that the pillow became too flat with use. To some buyers, the polyester cover of the original pillow is too rough. Though the original pillow comes with a pillowcase, the more expensive organic one does not. The big kid pillow is somewhat expensive, at $34.99. The best value in kids’ pillows is TILLYOU. The 13 by 18-inch toddler pillow costs, $13.99, or you could get the value pack of two for just $19.99. For big kids, there’s a 15 by 22-inch pillow for $15.99. Every option includes one pillowcase per pillow purchased, making TILLYOU’s children’s pillows an even greater buy. The core of the pillow is dense polyester microfiber filling that is thin enough that it won’t strain little necks, fluffy enough to be supportive and soft enough to comfortably lay your head on for a good night’s sleep. This fluffy down-like fiber filling is encased in a 200-thread count cover made of hypoallergenic 100 percent natural cotton. TILLYOU has more than two decades of experience manufacturing toddler bedding and offers a 30-day refund or replacement warranty. These soft, safe, hypoallergenic pillows are surprisingly affordable and compare favorably to pillows more than twice their cost. These thin yet fluffy pillows contain 250 grams of dense polyester microfiber filling that mimics the feel of natural down, wrapped up in a 200-thread count natural cotton cover. 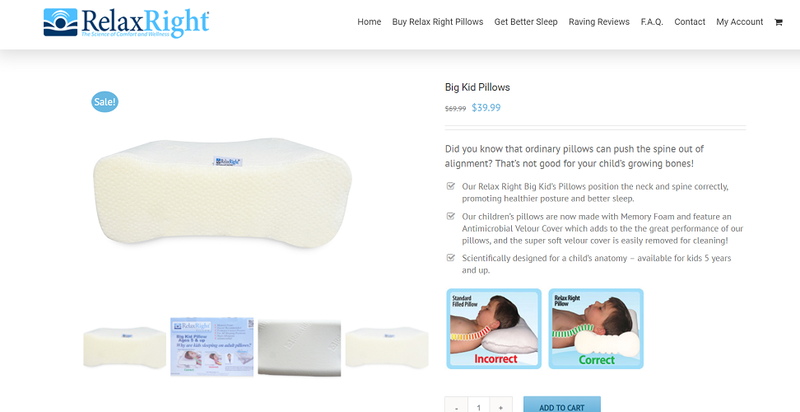 Chiropractors and pediatricians recommend these pillows for the support they offer little heads, necks and spines. Hypoallergenic and chemical-free, with no odor. A 30-day refund or replacement policy means you can feel confident that you aren’t wasting your money. More than 170 Amazon satisfied customers have written positive reviews of this pillow. The pillowcases are not wrinkle-free, and ironing is recommended after every wash, which can be a considerable inconvenience for busy parents. Some buyers found the pillowcases to be very rough initially and had to wash them several times before they felt soft enough for a young child you use. Purchasers have reported some problems with the fit of the pillowcases, with some finding that they were too tight a fit and others receiving ones that were too big to be safe or practical. Several buyers reported shipping errors, so new purchasers are urged to check their package carefully upon delivery to make sure they received the correct product.